The Burrow, 83 Brunswick Street, Fitzroy (entry via laneway at rear off Palmer St). 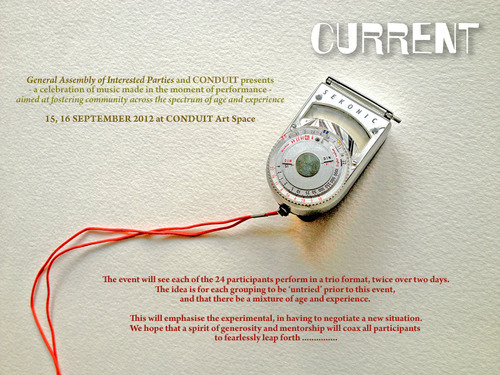 CURRENT is a communal inter-disciplinary performance event, this year curated by Candice Boyd and Michael McNab. Aeso Studio, 83 Brunswick Street, Fitzroy (entry via laneway at rear off Palmer St). CURRENT is a communal inter-disciplinary performance event, where new trios of artists, diverse in practice, gender, age and experience, are played out and reshuffled across a 2-day program. Experimental, improvised and musical forms of performance are to be expected as well as forms that consider language, the visual plane, space, movement and parallel action, grey areas between disciplines, the intersection of different senses and other associated forms. More artists TBA – dancers, poets and fierce inbetweeners! CURRENT’s aim is to provide a space for artists to present their ideas and test new ones in the moment, cross-pollinate with new audiences and collaborators, take risks, learn. Each artist will perform in two different trios of 20-30 minutes length; one on Saturday and one on Sunday. Each day will begin at roughly 2pm, and conclude at approximately 10:30pm. Come for as little or as long as you like and contribute to the vibe! Delicious drinks available for purchase at the bar. Specific set times will be posted here soon. Door charge = $10 for one day or $15 for both. This event takes place on the stolen land of the Wurundjeri people of the Kulin Nation. We recognise that sovereignty was never ceded. We pay our respects to their Elders, past, present and emerging. Current 2016 was held at the Moreland City Band Hall in Brunswick East during December. Extraordinary voice artist Jenny Ruth Barnes is guest curator for the first Current event of 2015. Coming to Conduit Art Space on Saturday 21st of March. We’re all excited to experience how her directions will unfold. Current: Sound Body Sight 2014 will be a single day event again at Conduit Art Space on Saturday September 20 beginning at 3:00 pm. through until 11:30 pm. The event will again feature combinations of musicians and dancers in trio format, however this time a visual artist will ‘modulate’ the trios interactions by offering stimulation in the form of prop, lighting, object, mask, body paint etc. General Assembly of Interested Parties, co-presenter of Current, now has a website located at; http://www.gaipsite.com There you will find upcoming events, archival media and information. WOW ! what an astonishing meeting of artists all prepared to challenge, inspire, find out about themselves and each other . . . . . . . . images and sounds soon . . . . . THANKS goes to NIHARIKA and ASHLEY McLELLAN for organising the dancers and again to LEO and MARIE for the CONDUIT experience. The General Assembly of Interested Parties Current 2014 is being held for one day only Saturday MAY 17 at CONDUIT Art Space. This event will focus on the space between sound and movement and will be curated on behalf of The General Assembly of Interested Parties by Niharika Senapati and Ren Walters. Each performance group will consist of either two dancers and one musician, or two musicians and one dancer. The event begins at 3 pm. sharp with each group performing for approximately half an hour. Performances will begin at 3, 4, 5, and 6 pm. Evening performances will be at 8, 9, 10 and 11 pm. We encourage participants and audience to attend as much of the event as possible. There will be food and beverages available brought along by the performers and augmented by hosts Leo and Marie. Please feel free to bring along a simple contribution. As much as a public presentation of artists’s improvising, Current is also an opportunity for interested parties to socialise. The dinner break at 6:30 – 8 pm. is clearly an opportunity to do this whilst enjoying some food together. PARTICIPATING ARTISTS: Alice Cummins/ Alice Hui-Sheng Chang/ Brett Thompson/ Caroline Meaden/ Chimene Steele-Prior/ Clinton Green/ Deanne Butterworth/ Dur-é Dara/ Fina Po/ Freya Schack-Arnott/ Gabriela Green/ James Macaulay/ Janette Hoe/ Maud Léger/ Michael McNab/ Niharika Senapati/ Nikki Michelle Soo/ Ren Walters/ Reuben Lewis/ Sam Hall/ Scott McConnachie/ Tim Crafti/ Tony Yap There will be an A3 poster available for distribution, but the primary means of advertising the event will be our WORD OF MOUTH. Of course social media will pay a role but this is all really up to each of us to communicate our enthusiasm to our friends and anyone willing to listen !! And, like many improvisational performance events this year will be dedicated to the legacy of David Tolley. Saturday performances begin at 3:00 pm. for a half hour on the hour with final set at 11:00 pm. Sunday performances begin at 2:00 pm. for a half hour on the hour with final set at 10:00 pm. There is a break at 7:00 pm. both days. ENTRY is by DONATION. Please leave us your email address so we can keep you informed of upcoming related events. Some drinks and food will be available.